Tertali: The Kamar tribe performs the Tera Tali, which is an elaborate ritual with many elements of dance. It is generally performed by two or three women who sit on the ground. Manjiras, or small metal cymbals are tied to different parts of the body, mostly the legs, and with a cymbal in either hand the dancer strikes these in rhythm. The head is covered with a veil, and at times a small sword is clenched between the teeth and an ornamental pot balanced on the head. Charkula: This dance is performed in the Braj region of Uttar Pradesh- the land of Krishna and his consort - Radha. Veiled women balancing large multi-tiered circular wooden pyramids on their heads, alight with 108 oil lamps, dance to the strains of 'rasiya' - songs of Krishna. Charkula is especially performed on the third day after Holi - the day, which Radha was born. According to legend, Radha's grandmother ran out of the house with the charkula on her head to announce the birth of Radha, since then, Charkula has formed a popular dance form of Brajbhoomi, performed during various festivities. 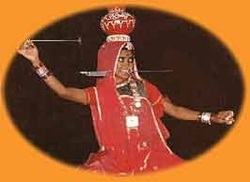 Jawara: The Jawara is performed in the Bundelkhand area of Madhya Pradesh. It is essentially a harvest dance-reflecting the gaiety and pleasure of the peasants who have reaped a good harvest. The dance is performed by men and women together. The costumes and jewellery worn by the women are colorful. The women carry baskets full of jawara on their heads and although the dance is very vigorous they are able to balance these baskets very skillfully on their heads. The accompaniment includes a rich variety of percussion, stringed and wind instruments.